What Models of Diversity want is changes and accepting normal size Real Woman from every ethnicity. What we see in Arts is Real Woman with curves, not anoroxic, unhealthy woman not representing Real Woman. We want women from different ages, and sizes on catwalk because real women are curvy. 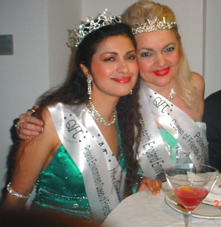 Dorota Lopatynska de Slepowron is a Beauty Pageant Queen. She is Mrs Commonwealth England Environment 2008 and Poland Environment Queen of Friends of the Commonwealth 2007. Along with Models of Diversity, Dorota campaigned for Anti-Size Zero at London Fashion Week at Kensington, London on 21 February 2009. Last year at Miss Commonwealth, her daughter Marta campaigned for Anti-Size Zero at Westminster near the Parliament. 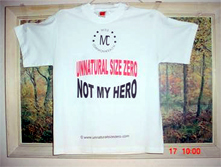 UNNATURALSIZEZERO.COM is a community initiative of Miss Commonwealth dedicated to the protection of young women's health and lives against the demands of fashion catwalk promoters for underweight models. 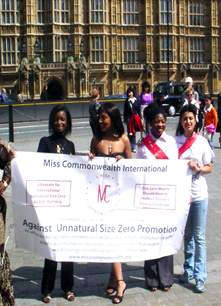 Miss Commonwealth successfully launched a campaign against catwalk promotion of underweight models at the unnatural size zero demonstration in Westminster on 18 May 2007. Miss Commonwealth queens delivered to the British Prime Minister a petition asking for legislation against the promotion of underweight models, and led a public lobby of Members of Parliament to support the petition. This campaign was aired on BBC Television, and the health recommendations of the petition were adopted by the British Fashion Council who owns and organises the London Fashion Week.